CINCINNATI -- The definition of what’s cool may be fickle and intangible, but that hasn't stopped Over-the-Rhine from being named among the top 15 coolest neighborhoods in North America in a new survey from real estate services firm Cushman and Wakefield . 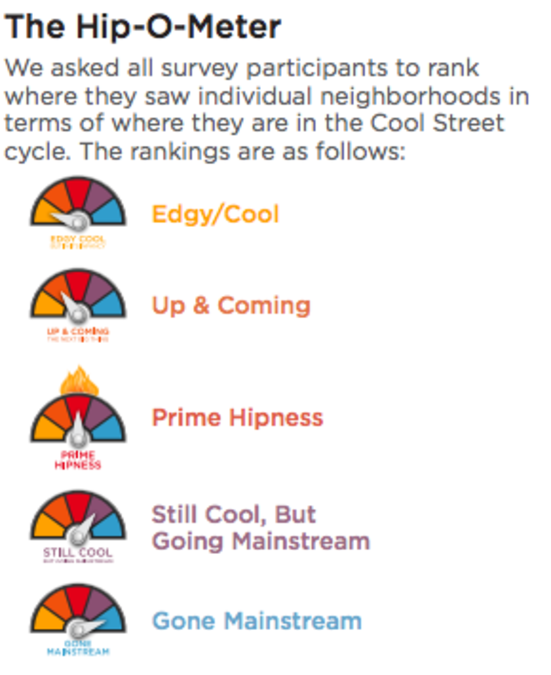 Calling OTR “a craft-brewed neighborhood,” the survey ranks this Cincy neighborhood at “up and coming” on its five-point Hip-O-Meter, which ranks neighborhoods from edgy/cool to gone mainstream (and ironically possesses one of the most uncool names for a survey metric). Findlay Market, Taft’s Ale House, Rhinegeist and Bakersfield all get mentions in the survey’s write-up of OTR. Real estate professionals across the United States and Canada ranked their cities’ neighborhoods on a variety of factors, including livability, retail options, residential and retail rents and demographics. As evident in the chart below, Over-the-Rhine notched top rankings in nearly all retail categories and most livability categories, with the notable exceptions of access to higher education and bicycle friendliness. Although no other Ohio city cracks the top 15 list, the full list of the top 100 cool neighborhoods includes two Cleveland districts, Columbus’s Short North, two Indianapolis neighborhoods and Louisville’s Highlands area. Read the full survey here .